Friday, August 22, 2008: Derry, New Hampshire – HomeAdditionPlus.com released today its Kitchen Remodeling Bid Sheet. 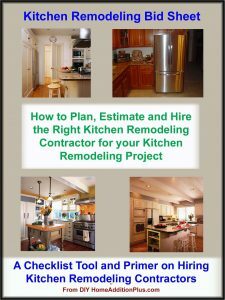 The Kitchen Remodeling Bid sheet is an ideal tool for helping homeowners obtain contractor bids / quotes from prospective kitchen remodeling contractors. A key element of the bid sheet is an extensive list of questions compiled in a “Request for Quote” questionnaire format that homeowners provide to prospective general contractors for bidding the project. The bid sheet also includes a separate spreadsheet tool to allow homeowners to estimate and tract material and labor costs throughout all phases of the kitchen remodeling project. The 25 page, Kitchen Remodeling Bid sheet’s Request for Quote questionnaire form consists of over 110 questions on all aspects of kitchen remodeling. In addition, the bid sheet provides extensive and important advice to homeowners on how to work with a kitchen remodeling contractor and his sub-contractors in order to ensure a kitchen remodeling project is completed on time and budget, and to the full satisfaction of the homeowner. Finally, it provides a list of manufacturers for key products for the kitchen, including nationally and internationally recognized cabinet and appliance manufacturers. Kitchen Remodeling topics discussed in the bid sheet include: Framing, Electric, Plumbing, Heating, Drywall, Insulation, Finished Carpentry, Flooring, Painting, Ceilings, and more. In addition, the bid sheet discusses Start and Complete Dates, and provides estimated time intervals to complete specific trade activities. It also addresses other topics such as Workman’s Compensation and Liability Insurance Coverage, Debris Disposal, Budget Allocations for Flooring and Appliances, Reference checks and estimated building costs and payment schedules. It also includes a separate and extensive Excel spreadsheet form for allowing homeowners to enter their own estimated and actual remodeling costs. The Kitchen Remodeling Bid Sheet is priced at $17 and can be purchased on line at Kitchen Remodeling Bid Sheet and is immediately downloadable. For help on building a home addition, see HomeAdditionPlus.com’s Home Addition Bid Sheets. Our Home Addition Bid Sheets provide you with the knowledge and information on how to plan a home building project, and what to look for when hiring contractors. They also include detailed cost breakdown tables and spreadsheets for estimating your own new home construction building costs. Fill out our 3-5 minute quick and easy form, and receive a free price quote on kitchen remodeling from one of our prescreened and licensed kitchen remodeling contractors. This process is free and there is no obligation to continue once you receive your kitchen renovation price estimate.